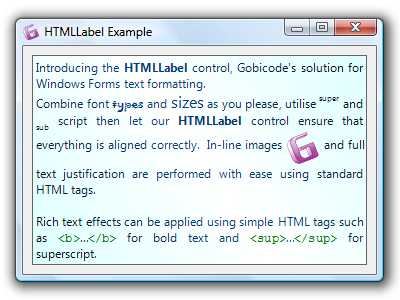 Gobicode's HTMLLabel control brings the power of HTML to Windows Forms. Designed to replace the standard Label, the HTMLLabel parses the contents of its Text field, processing HTML tags and adjusting its content accordingly. The HTMLLabel provides unprecedented levels of text and image formatting to Windows Forms, it is now incredibly easy to render rich text effects such as super/subscript, full text justification and in-line images. In addition to displaying HTML formatted content, the HTMLLabel can also render this content to any Graphics surface, thereby allowing developers to extend their own controls with richly formatted text and images. Qweas is providing links to HTMLLabel for Windows Forms 1.0 as a courtesy, and makes no representations regarding HTMLLabel for Windows Forms or any other applications or any information related thereto. Any questions, complaints or claims regarding this application HTMLLabel for Windows Forms 1.0 must be directed to the appropriate software vendor. You may click the publisher link of HTMLLabel for Windows Forms on the top of this page to get more details about the vendor.